As a showcase of the Cumberland Moot Court program, the final round of the Janie L. Shores Moot Court Competition was held on Saturday, April 9, during Admitted Student Weekend/Alumni Reunion Weekend. The judges selected Andrew Clay as the winner and Adam Hoekenschneider as the runner-up. 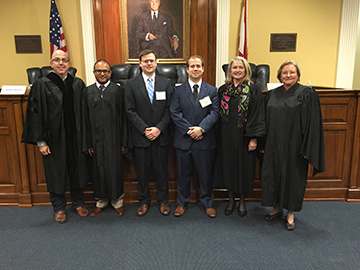 Judges included Chief Justice Karon Bowdre ‘81, U.S. Northern District of Alabama, Charlie Shah ‘96, Moot Court National Team Coach, Marion Walker ‘76, Fisher & Phillips LLP, and Mike Gregory ‘98, Dodson Gregory. The competition is named for Janie L. Shores, the first female justice to serve on the Supreme Court of Alabama who became the first full-time female law faculty member in Alabama when she joined Cumberland School of Law in 1965. The competition is an annual event held in the spring and focuses on sharpening the appellate advocacy skills of second- and third-year law students. In the Shores competition, participants compete in pairs. They write the argument portion of a brief and argue those issues in front of practicing lawyers and judges who act as appellate court justices. As teams advance, they argue the opposing side of their issues. The Henry Upson Sims Executive Moot Court Board would like to thank all of the students who participated in this year's competition, as well as all of the judges who volunteered their time.